visceral a level. And its protagonist wasn't quite so much a no-nonsense kind of guy. Kerry's white hair was the first tip-off that this was a different kind of crime fighter. He didn't stray as far from the Tracy template as Rip Kirby did a few years later, but he may very well have pointed the way. Kerry set a precedent for Kirby in other ways, as well. The two strips both originated as the idea of a writer, but the artist insisted on — and got — full credit. The writer in this case was Allen Saunders, co-creator of Big Chief Wahoo, which eventually, in a couple of steps, metamorphosed into Steve Roper & Mike Nomad. Saunders also scripted Dan Dunn, a more conventional Tracy knock-off. Later, he helped set the tone on Mary Worth, which became the prototype for the post-World War II soap opera strips. And Alfred Andriola was the artist. He'd gotten his start in the comics business by writing a fan letter to Milton Caniff about Terry & the Pirates, and subsequently taking a job in the studio Caniff shared with cartoonist Noel Sickles. By the time Kerry Drake came along, Andriola had put in several years on a comic strip about Charlie Chan, created a minor comic book superhero named Captain Triumph, and collaborated with Saunders on Dan Dunn. It was when Dunn was canceled, in 1943, that Saunders and Andriola launched Kerry Drake. The latter started from Publishers Syndicate (Judge Parker, Brother Juniper) on Monday, October 4 of that year — which, coincidentally, happens to have been 12th anniversary of Tracy's debut. It was popular enough to be reprinted in a Harvey comic book from 1948-52, but didn't spawn any movies, TV shows etc. The title character originally worked as an investigator for the local prosecutor's office, but in the early '50s, when his fiance and secretary, Sandy Burns, was murdered, he joined the police force. 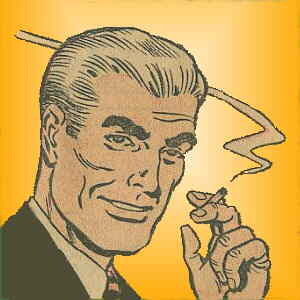 Bulldozer, the man who killed Sandy, was one of a long succession of Tracy-style flamboyant villains. Others included Dr. Prey, Bottleneck, Mother Whistler and No Face, to name but a few. That came to an end when, in 1958, Kerry Drake married a police widow named Mindy — and this time, there were no last-minute killings to prevent the nuptials. After that, the strip shifted its focus toward the personal lives of Kerry and Mindy. There was still plenty of action (tho much of it was performed by Kerry's younger brother, Lefty), but to a large extent, Kerry Drake became a sort of police-oriented soap opera. This trend reached its apotheosis in 1967, when Mindy gave birth to quadruplets — making Kerry, without a doubt, the only white-haired father of quads in all the ranks of adventure heroes. The "soap" approach seems to have gone over well. In 1970, Andriola received The Reuben Award, given by The National Cartoonists' Society to the Cartoonist of the Year, for his work on Kerry Drake. A few years after that, Saunders retired. He was replaced by William Overgard, whose credits run from a Dell comic book starring Steve Canyon to Rudy, a strip about a talking, clothes-wearing chimpanzee in a world of normal humans. Andriola remained the strip's artist, tho he relied heavily on assistants. Among the better known are Fran Matera, whose other credits include Treasure Chest and Little Annie Rooney, and Jerry Robinson, famous for his work on the early Batman. But the one who held that position longest was Sururi Gumen, who came on board in 1955 and stayed as long as the strip itself lasted. In 1976, he became the only person ever allowed to share credit with Andriola — but by then, he was doing the art all by himself. Andriola died in 1983 — but even then, he didn't relinquish credit, as Kerry Drake ended with him.